On the 30th September, the first two years of execution of the 2015 ERC Consolidator project (Ref. 683018) “PALEODEM: Late Glacial and Postglacial Population History and Cultural Transmission in Iberia (c.15,000-8,000 cal BP), have been completed. This is the first European project, ERC (European Research Council), developed in the IPHES (Catalan Institute of Human Paleoecology and Social Evolution). It is carried out under the direction of Javier Fernández López de Pablo. This is a five-year research project on paleodemography and cultural transmission in a period of great climatic and environmental transformations. Specifically, PALEODEM is comparing different paleodemographic indicators, with multidisciplinary paleoenvironmental reconstructions to understand how climatic changes, at the end of the last glaciation and the beginning of the Holocene affected populations at the local, regional and macroregional scales. Recently, within the framework of the XXIV Annual Meeting of European Association of Archaeologist (EAA), a monographic session has been organized. On that occasion, the interdisciplinary team presented the work in progress that will be subject of publication in the next months in various scientific journals with an impact factor. Precisely, at the EAA session nine papers were presented, studies signed by postdoctoral researchers (Ana Polo and Magdalena Gómez), as well as the rest of the IPHES members taking part in the project (Javier Fernández López de Pablo, Sergi Lozano and Francesc Burjachs), and the external collaborators (Yurena Yanes, Samantha Jones, Carlos Ferrer, Yolanda Carrión, Ana Cantó, and Luce Prignano). During the first two years, research has mainly focused on the interdisciplinary study of two open-air Mesolithic sites located in the surroundings of the Villena paleolake (Alicante): El Arenal de la Virgen and Casa Corona. Ongoing analysis comprises geoarchaeological aspects, paleoenvironmental reconstruction from pollen data, a new radiocarbon dating program, as well as the intra-site spatial analysis of lithic assemblages associated with occupation structures. In the last months several studies of paleodemographic modeling and network analysis have been also developed. The session also has reckon with the participation of two invited researchers of recognized prestige, external advisors to the project, Professor Marco Madella and Dr Jorge Martínez.These experts,“positively assessed the work done and the potential scientific scope of the different contributions presented, since the integration of the different studies has allowed to obtain new bases to understand the relationship between the dynamics of occupation and climate change of the last populations of hunter-gatherers in the Mediterranean basin “-says Javier Fernández-. On the other hand, in the last months new personnel has incorporated into the project: predoctoral researchers Carolina Cucart and José Ramón Rabuñal, and postdoctoral researcher Rowan McLaughlin, who will analyze aspects of space-time radiocarbon modeling. 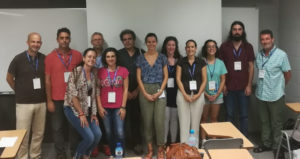 The Archaeological Micromorphology and Biomarkers Laboratory (AMBI Lab) hosted at the University of La Laguna (Canary Island), invites Ana Polo-Diaz to give a conference about the ERC-project PALEODEM.